both come from a misunderstanding of the Model. It’s helpful to address these concerns right at the outset. When first hearing about the Ten Terrains Of Consciousness, some people think that it is ten different 'levels' of consciousness, like steps on a ladder. They think that we are judging some people as being 'better than' or 'ahead of' or 'more evolved than' others. 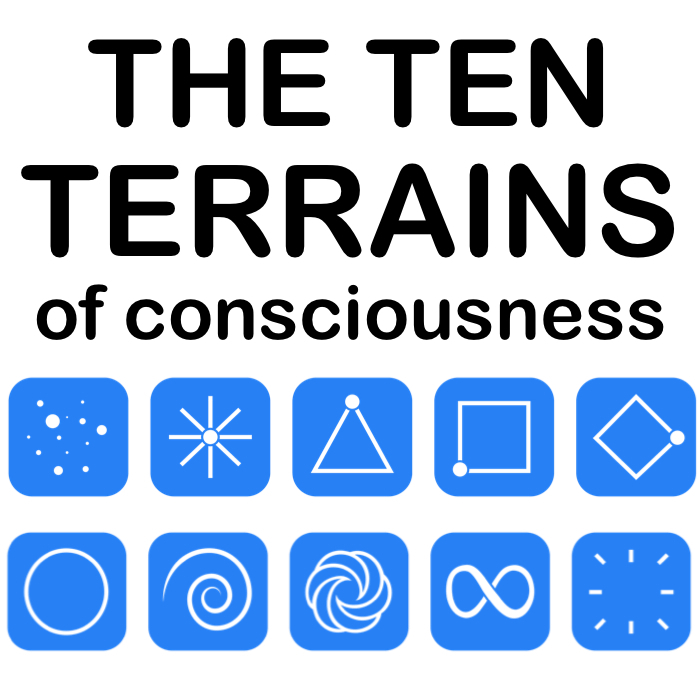 However, to think that the ten Terrains are ten 'levels' of consciousness reflects a misunderstanding of the Ten Terrains Model. ​The Ten Terrains are not ten different levels, they are ten different filters on the ONE Consciousness. The idea of 'levels' of consciousness comes from the Reflection-Based Terrain (Diamond), which—as well as being a profound Terrain of self-inquiry, growth and expansion—is an externally-focussed Terrain where people evaluate themselves in comparison with others. The Diamond view of spirituality necessarily and inherently includes judgment-based ideas such as 'levels', ‘ascension', 'awakening' and 'enlightenment'. The Ten Terrains Model is not coming from the Reflection-Based Terrain (Diamond). It is coming from the Unity-Based Terrain (Infinity). From the perspective of the Infinite Self there is no journey at all, there is only ever this one ‘Now’ moment, and everything we are experiencing is a holographic projection created by the sum total of all our charge force. This is how we—the Co-Creators of the Ten Terrains Model—view the Ten Terrains. From the perspective of Infinity, no one Terrain is better than any other. They are simply ten different ways to see the world. The Terrain you are at right now is exactly where you are meant to be. It is indeed your creation. Each Terrain has unique gifts, challenges and lessons. You have chosen to create this as your reality in this moment in time to experience those things. There is no goal here in this spiritual journey. No ‘enlightenment’ to attain. No ‘ascension’ to reach. This moment is all there is and all Terrains are equally valuable choices for how to create this moment. 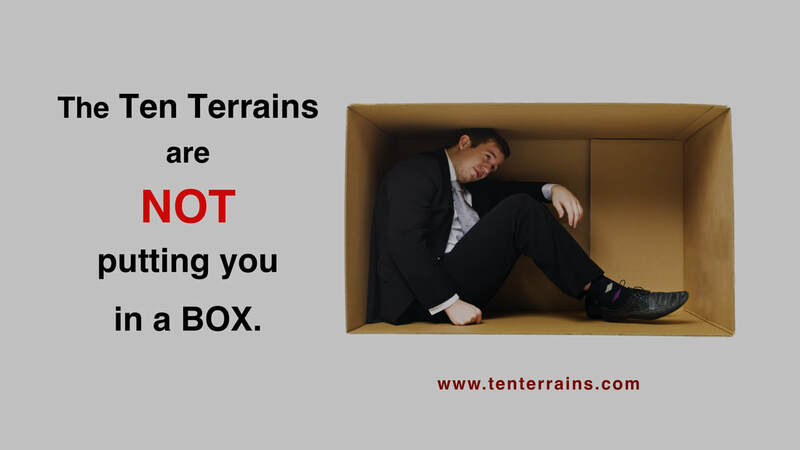 Many people, upon first hearing of the Ten Terrains Model, get quite outraged that someone could dare suggest they are at one Terrain of Consciousness. They like to think that they are at multiple Terrains, or that they can choose which Terrain they are at or which Terrain they will shift to. They dislike being told that they will only shift from their current Terrain if and when their Infinite Self decides to. These objections come from a very healthy place. They come from the natural human urge towards freedom. No one likes to be put in a box. This is particularly true of people at the Reflection-Based Terrain (Diamond) who treasure freedom in all its aspects, like to be in control of their own evolution, and tend to be the quickest to misunderstand this Model. It is also somewhat true of people at Square and Circle. However, being at a particular Terrain of Consciousness is not a threat to your freedom. It is not stereotyping you. You are a unique being with your own unique talents, skills, personality, life purpose, genetic lineage, body type, soul family, past lives, holographic dimensions, etc etc. However you do have certain things in common with some people. You have a cultural background in common with those people who grew up in your country, in your era. You have hair color in common with those people who have the same pigmenting as you. You have beliefs in common with people who share the same conditioning as you. You have your Terrain of Consciousness in common with people who have the same core relationship with reality as you do. That is all. 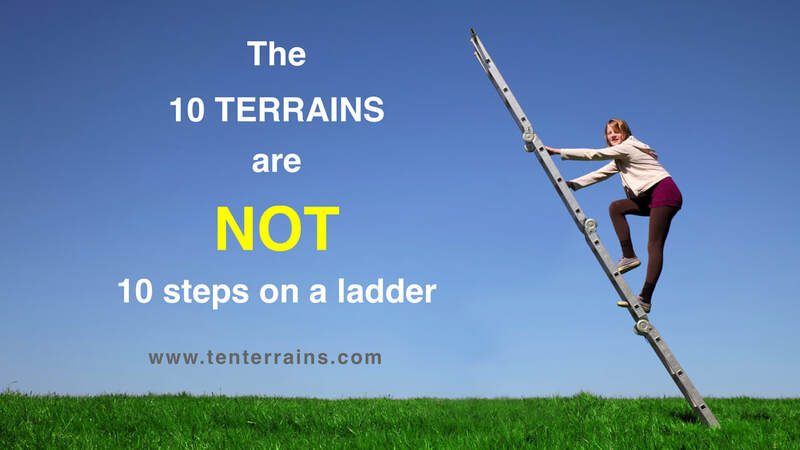 The more you come to understand the Ten Terrains Model, the more easily you will be able to see your own Terrain playing out in your choices, your actions, your reactions, your behaviors and your words. The more you will be able to draw on it to connect with like-minded people, find compassion for others, and be at peace with what is happening in our world. Instead of fearing being put in a box, you will celebrate this tool of self-knowledge which is explaining so much in your life. Your purchase of our educational materials helps us ​to bring the Ten Terrains teachings to the world . Thanks for your loving support!